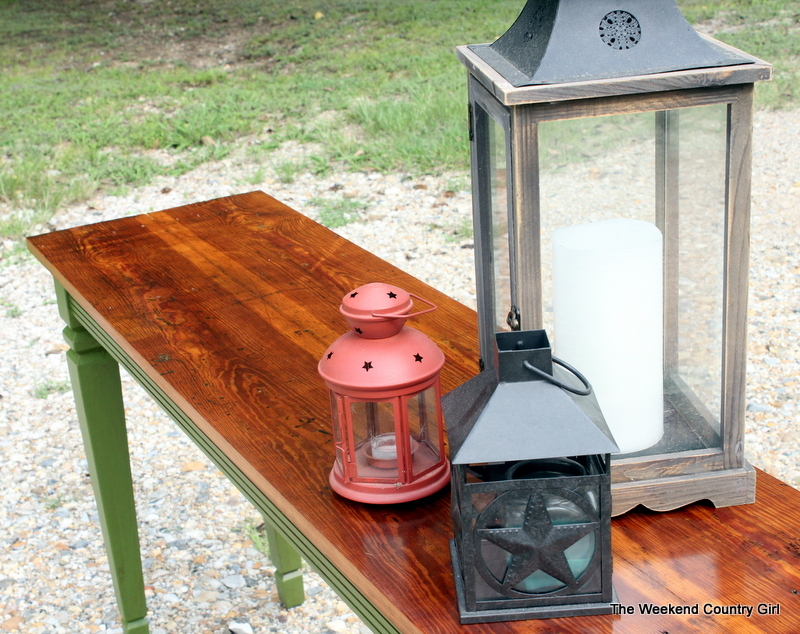 The best time to shop for anything at a resale shop or an auction is when no one else is willing to be out shopping. If you want the best deals go when it is raining, early in the morning or, like we just did, when it is blazing hot. It was 102 on the truck thermometer and we were pooped after a day of shopping when I spied this table sitting outside a charity resale shop. It had just been delivered and heat waves were radiating off the black asphalt where it was sitting. The table was marked $60.00. I walked around inside the store for a little while then asked the lady at the register what she would take for the table. To my surprise she said it was too hot and heavy to bring in so if we wanted it we could have it for $20.00. Sold. 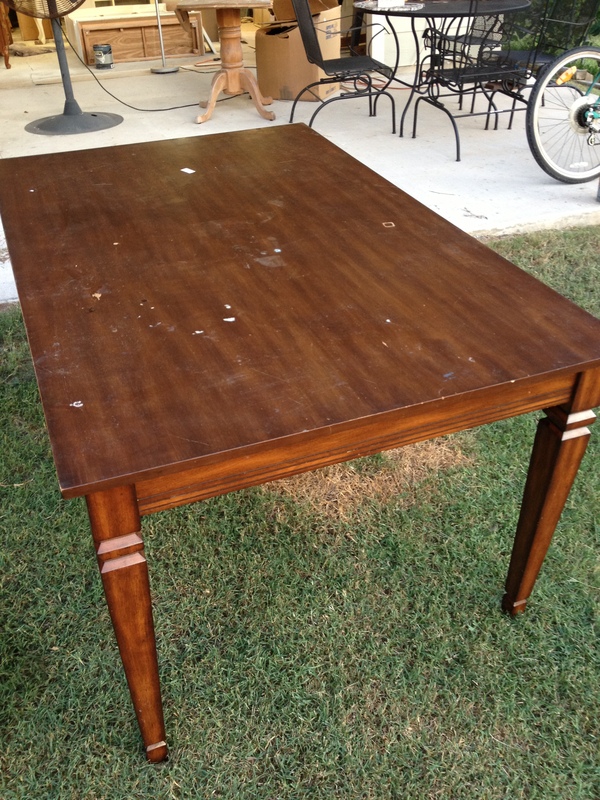 I really only wanted the legs of the table, but both Hubby and I were surprised at the quality of the table as it was loaded. I knew immediately what I wanted to do with it. I need want a buffet table at the end of our breakfast room. 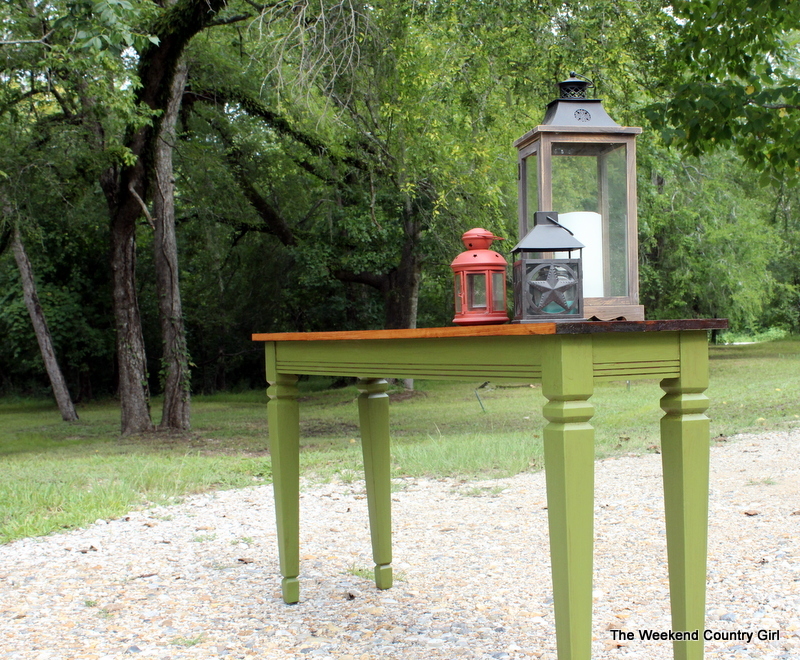 I have been secretly jealous of my friend Robin’s green end table with a stained top so the color was obvious…well to me it was. 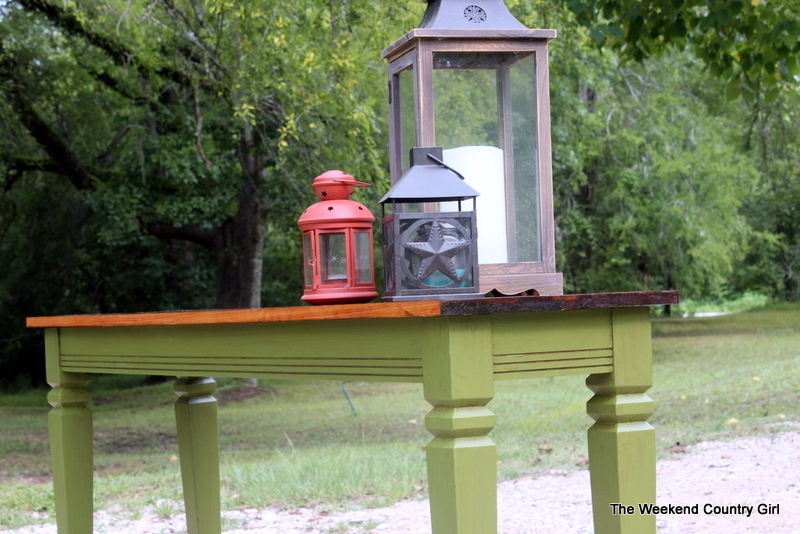 We worked on getting the base and table top cut from the original table, but it was just so new and commercial looking. Yes, I am one of those people who like a room to look collected, not bought as a set. I feel the same about furniture. I want unique, original and character. Hubby and I sat in the Garagemahal looking at the piece when it came to my husband. Use the wood from my dad. the plank has been sitting in the hoard over a year. It is heart pine and full of character. I love that my dad saved it from a trash pile at the place where he worked for 30 years. 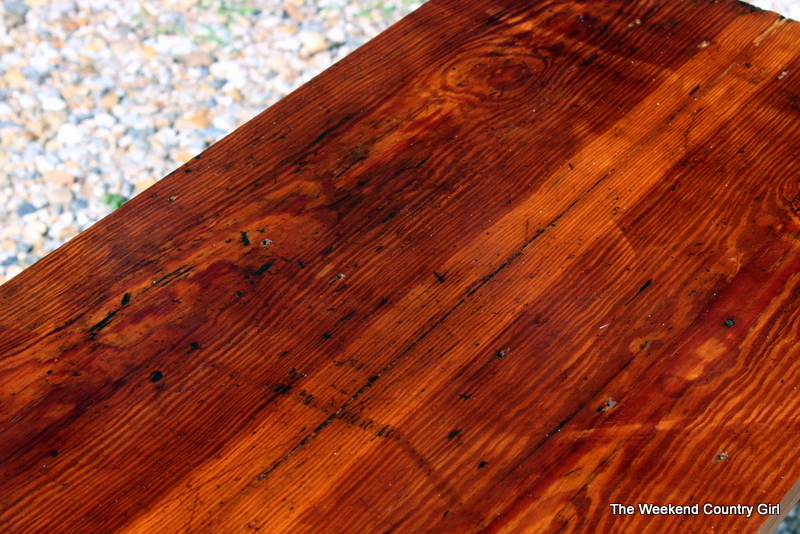 According to my dad the wood was used as a drafting table in the shop of Gulf States Utilities. He said it was built in the 40’s and was already old when he started there in 1960. A quick measurement let us know that it would work. Yay! It needed a quick cut down to the sides to make it fit, a rub down with mineral spirits to clean it, and a coat of poly. Nothing else.It will live in our house proudly. I love wood with history. The color is a little richer than Behr’s Happy Camper, because I needed it to match my fabric on the chairs in the breakfast area. I chose Behr’s Jungle Trail. One coat of Bona Floor Poly on this was enough to bring out the shine but not make it too glossy. I love those nail holes. 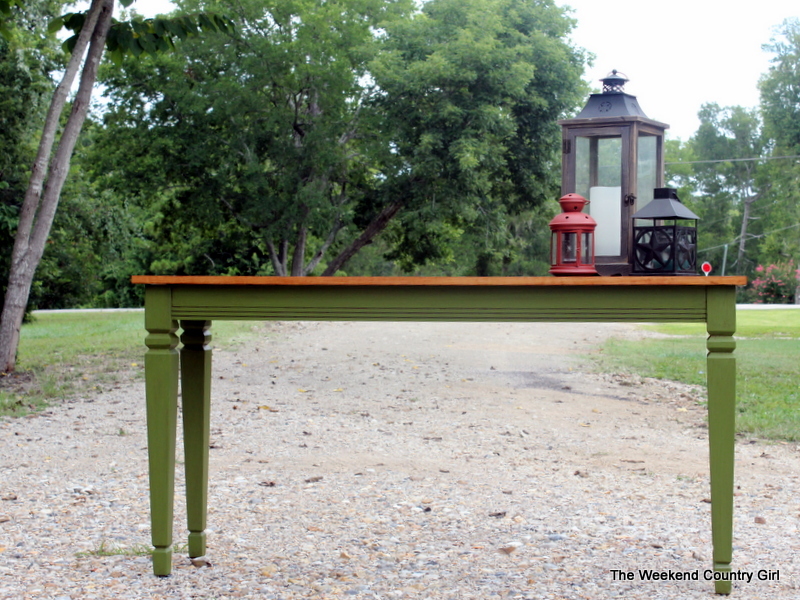 It is hard to photograph a green piece of furniture at Star Hill. I had to move it to the gravel road to allow it to show up. Lots of work took place on this old wood. I love that my dad saved it from the trash pile and held on to it for more than 10 years before I got it. It looks amazing. It was so well made that the two pieces of wood match perfectly. We thought it was one piece of wood until we got it cleaned up. Thats a very pretty color combination. The green goes well with the stain you chose. 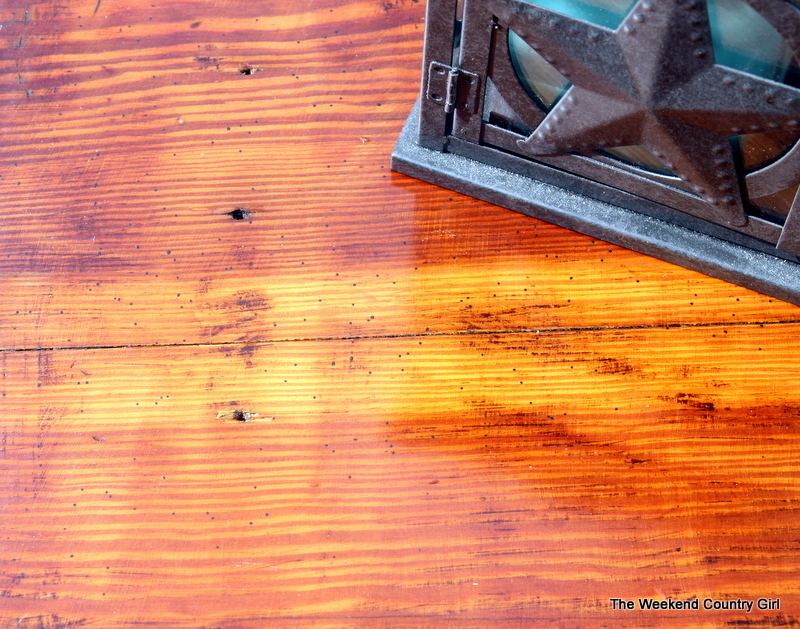 There is no stain on the wood. Just age. The poly did make it a deeper color. Beautiful! I really enjoy reading your blogs and have been inspired several times by the work you do. Thanks for sharing this! Thank you! I appreciate you taking the time to let me know you read what I write. 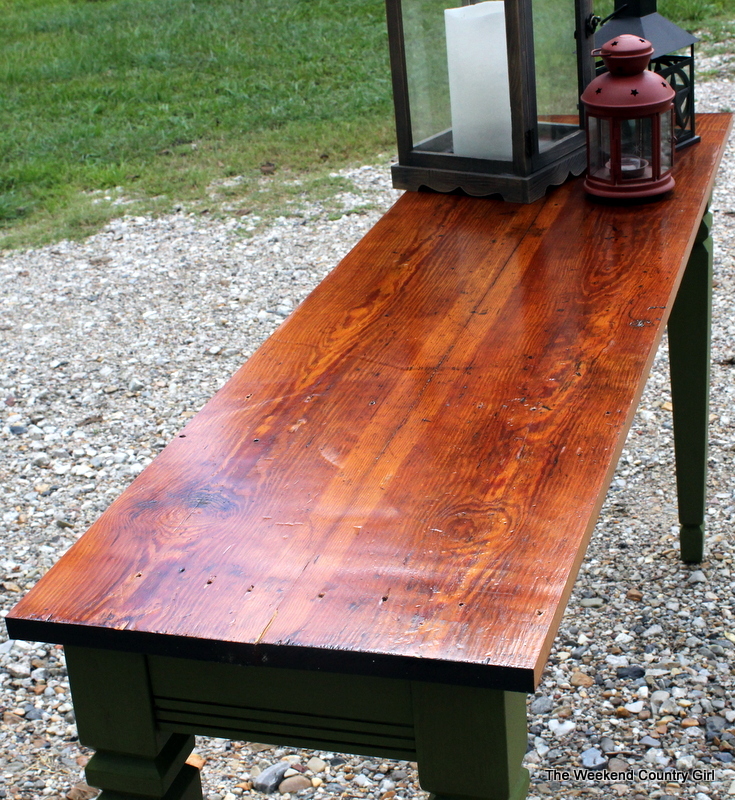 This is gorgeous–Love how you were able to use the wood from your dad’s job!